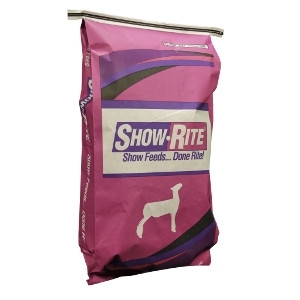 Show-Rite NewCo Lamb Feed D22.7 is a complete feed specifically designed to maximize muscle development and provide an ideal handle while maintaining enough fat cover for the extra-smooth finish. It is formulated with Alltech technology to support a healthy digestive tract and immune system. Vitamin A, min 5,000 IU/lb. Vitamin D, min 500 IU/lb. Vitamin E, min 170 IU/lb.